There are a number of amazing new features from the new Google Ads UI that are huge improvements to the previous experience. That being said, there are a few things missing from the new UI that we miss and want back. Several of these features helped us manage and improve performance for our Dynamic Search Ads (DSA) campaigns, including year-over-year search query comparisons, category level performance reports, and website coverage percentages for categories and subcategories. This is not isolated to DSA, but with the new UI, Google will not show comparison SQR data on any searches that did not trigger ads in the last 30 days. What does that mean? When comparing YoY, you cannot see what all the searches that happened in the previous time period were. That data will not appear in comparison mode. Instead, when trying to diagnose how conversions or searches have changed over time, you must toggle to last year’s data, download the SQR, and then toggle back to the current year to compare. This can be incredibly frustrating. This impacts DSA more than any other campaign type because, unlike in regular search campaigns, you have no keywords and thus can’t quickly identify where your campaign declines or increases are coming from. For example, in the campaign below, we actually had 10.5 sales last year, not 2.1 like the new UI is suggesting. Given the benefits that true YoY comparisons bring, this is a feature we are dying to have back. An extremely useful way to generate more conversions in DSA campaigns is to isolate different categories from your site into their own ad groups. This allows you to invest more spend in sections of your site that generate more sales. For example, if t-shirts sell better than socks, you can separate those out and give them different bids. 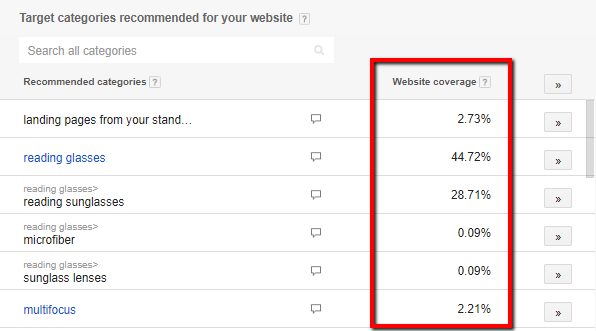 In the old Google Ads interface, you could easily see category-level performance to identify these different categories. Now, in the new UI, there is no easy way to see individual category performance unless those targets are already isolated in an ad group. This makes category isolation a bit of guess work, since you do not have conversion and revenue data for each category. Yes, you can break out categories by search volume, but what if one niche category generates the bulk of your revenue? What is more valuable to bid on individually? The last portion of DSA that has changed in the new UI is the ability to see how much of overall website content a specific category comprises, as well as their subcategories. Although it is a small portion of the day-to-day management of DSA campaigns, these two features screenshotted above allow you to see how content is categorized on your site (rather than relying on search volume). If you have a large portion of your site dedicated to reading sunglasses, but no coverage in DSA or a search campaign, you could be missing out on very qualified traffic. People likely aren’t searching “reading sunglasses” as often as they are searching for “sunglasses” or “reading glasses”, so in the new UI view, the more specific searches may get overlooked. As we all get familiarized with the new UI, there are bound to be some hiccups and learning curves to management, but these features helped make an amazing tool (DSA) even stronger. Google, if you are listening, please bring these back! If you’re looking for help running your search campaigns, contact our team.